Mary helped in the kitchen of our school, Commonwealth School, the first year that he and I attended. The Commonwealth Kitchen was an amazing place where the ever memorable Ila Moore cooked gourmet meals for 250 every day. Mary was her right hand man, that first year, and was sweet and observant. I am pretty sure that she helped get me my job for the next year when she brought Miss Moore over to see the careful way that I wrung out the dish cloth. Why was I wringing out a dish cloth at school? While the kitchen did hire student helpers, I was not yet one of those. But at Commonwealth, all students worked as part of the curriculum. Everyone had two weeks of a meal job — washing dishes, setting up and taking down tables, bringing food to the tables — two weeks of a non-meal job such as dusting the woodwork or sweeping, and two weeks off. As the oldest daughter in an ever-growing family, I had more kitchen skills than some of my classmates. I had started school behind the others, academically, and so this talent gave me a chance to shine, to instruct and to lead. I worked during my free periods for Miss Moore and her new helper, Audrey, for three years after Mary had retired. My ninth grade year, I discovered on the walk from Copley Station to school that the newsstand on Dartmouth sold flowers, $2 for a bouquet and $4 for a basket, and that you could buy a cake and candles at the convenience store further down on the way to school. Whenever I learned that someone had an occasion, I shook down friends for enough money to buy a cake for classmates, flowers for faculty. I contributed, but I couldn’t foot the whole bill. At the time I was earning fifty cents an hour at the family store, so a whole basket was a little beyond my means. But at the end of that freshman year, when I learned that Mary was retiring and that today’s lunch would be her last meal with us, I was shocked to learn that no fuss was going to be made. No. Attention must be paid. I made the rounds of friends and classmates and gathered enough to buy a basket of flowers, which I bought during my free period. After lunch at school we were encouraged to make announcements about various things. I had made an announcement about Mary’s retirement, encouraged her to leave the kitchen to receive the basket, and led the school in giving her a rousing ovation. It had just struck me as the thing to do. Now, two years later, my brother ran into her at the store and she had told him how touched she was by the gift. 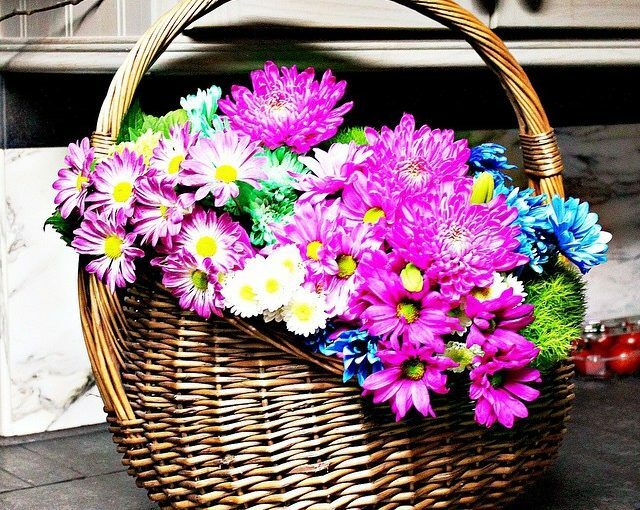 He said that she had dried the flowers and had saved the basket. I had no idea. Giving people such things was just….what we do, something I tried to bring from our life into the culture of the school. 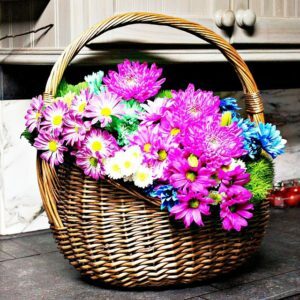 Now, when I think about doing some small thing and then decide it can wait till later, or that maybe it’s not a good idea, I remember that somewhere someone has dried flowers and an empty basket that she treasures. That’s the tie breaker, when I am undecided. It’s never a bad idea to give someone tangible proof of your love.